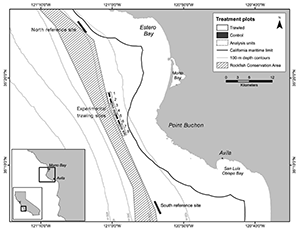 A collaborative research study funded in part by the OPC, conducted by California fishermen, The Nature Conservancy and CSU Monterey Bay found negligible effects to the seafloor in certain types of “soft” sea bottom (primarily mud and sand) on the continental shelf off central California when using small footrope trawl gear. This study adds to a growing body of literature from around the world showing trawling impacts are context dependent—they depend on the type of gear used, the types of habitats trawled and how often trawling occurs. For more information please read the peer reviewed study here. The study does not imply that all soft-bottom habitats should be open to trawling but that, with new research and technology – there are mechanisms to fine-tune fishery regulations to protect vulnerable habitats while also help to sustain local commercial fisheries.